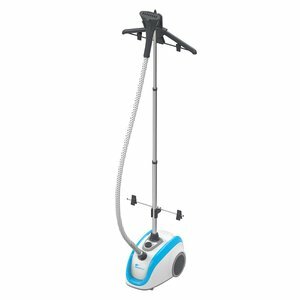 The Steamfast SF-560 Deluxe Fabric Steamer is enhanced steaming with a 68.5 ounce water tank, cool-touch fabric hose, 4 steam settings, foot-operated power switch and much more. Hot steam penetrates deep into fabrics and relaxes fibers, releasing wrinkles faster than ironing and freshening clothes in seconds. The Deluxe Fabric Steamer is gentle on your most delicate fabrics, yet works equally well on drapes, upholstery and other heavier materials. Powerful steam not only freshens fabrics and releases wrinkles, but reduces dust mite allergens, kills germs and bed bugs as well. Less expensive and much safer than dry cleaning, the Deluxe Fabric Steamer requires no chemicals, making it safe for use around your family and pets.